It seems the last may not have been heard of political violence in Lagos as a female supporter of the All Progressives Congress, APC, was allegedly hacked to death during a door-to door campaign rally in old Alimosho Local Government area of the state. 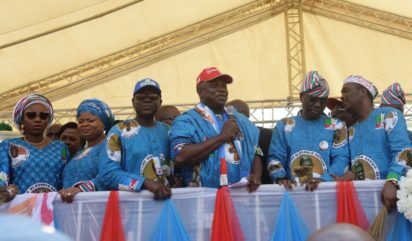 The rally was organised by party leaders in the area, Egbe-idimu Local Council Development Area, LCDA, led by Alhaji Abdullai Enilolobo to canvass support and votes for President Muhamnadu Buhari’s re-election bid and that of the Lagos State Governorship candidate, Mr. Babajide can Sanwo-Olu, Lagos West Senatorial candidate, Senator, Solomon Olamilekan, popularly called, “Yayi.” and other APC candidates in the forthcoming general elections. Recall that a similar incident occurred earlier in the month at the official flag-off of APC campaign at Ikeja, Lagos, where the popular officer of the National Union of Road Transport workers, Musiliu Akinsanya, popularly called, “MC Oluomo,” was attacked and stabbed by a member of a rival group. He has since been discharged after medical attention and currently recuperating in an undislosed location. Aftermath of the bloody event, the leadership of the party, led by it’s chairman in the state, Alhaji Tunde Balongun, announced suspension of mega rallies but directed that a door-to-door campaign rally should be adopted at various council’s as part of measures to eliminate possible violence. Vanguard learned that trouble started at the rally, held somewhere at Egbe area of the council, Old Alimosho, Thursday, when some yet to be identified cult group members allegedly attacked another rival group over sharing of money, and in the process, the victim was stabbed repeatedly, before she later gave up the ghost. Many others were said to have sustained different degrees of injury in the process. The development led to panic among residents as news filtered in that the rival group members were planning a reprisal attack soon. However, when contacted, Lagos State Police Public Relations Officer, PPRO, Chike Otti, denied any knowledge of the incident, but admitted there was a campaign rally by APC, which he described as “peaceful.